Header photo of Kurdish YPJ and Peshmerga fighters. Taken in Kobane. As I discussed in a previous post, evidence suggests ISIS has entered a period of slow decline and fragmentation as a military presence. While this has not been an abrupt phenomenon - certain aspects of their strategy and governance may have been fundamentally self-destructive in the first place - there seems to have been a particular point at which the fight against them took a pronounced turn. It’s been nearly a year since ISIS suffered the most ignominious defeat of its existence thus far, and much of the anglophone world still hasn’t heard of it. ISIS’ social media rantings and brutal theatrics have a profound distracting effect, one that’s uniquely well-suited to covering up how embarrassingly underqualified they are as a conventional military force. This wasn’t readily apparent to the casual observer throughout 2014 when the region’s extreme instability allowed ISIS to rapidly capture neglected territory in Syria and Iraq. But the Kurdish resistance in Kobane pierced that illusion of invulnerability and forced the jihadis to confront the hardened realities of a prolonged guerrilla campaign. In increasingly obvious ways, ISIS has been floundering ever since. Small-scale insurgent warfare is often fought in increments, with massive upsets less common than more subtle motions toward a gradual outcome. The Iraqi and Syrian insurgency has been generally fought along those parameters, which made the turning point in Kobane all the more crucial. Most observers in America and Europe use World War II as a primary reference point for what large-scale, multinational warfare looks like. And before wars of that caliber fell out of style, it was easy to reduce most conflicts to a series of pivotal battles. The irreversible turning point against the Nazi regime in Europe’s Western front can be traced largely to the D-Day landings. On the eastern front, the fateful stand at Stalingrad was what crippled and ultimately shut down Hitler’s attempted incursion into Russia. There’s a persistent human temptation to valorize combat and transform the violent chaos of warfare into something that's sanitized in hindsight. Battles that can be rendered as heroic advances are well-suited for this purpose, hence why D-Day has sustained such an ironclad grip on the American imagination. But in terms of events capable of breaking the will of an opposing army, few things are more effective than a failed siege. They’re far bloodier and more harrowing than a charge across open terrain, but hardened resistance against an invading army has often been the deciding event in warfare throughout history, no matter the scale or scope. The Russian holdout at Stalingrad profoundly degraded the capacities of the Nazi war machine, decimating their numbers and eventually forcing the Wehrmacht to retract entirely from the eastern front. The battle drastically impacted the morale of both armies - the Nazi forces suffered a string of subsequent failures, and the Soviet army pushed back victorious and unbowed across the eastern front until they reached Berlin in 1945. There was even an adage common among soldiers of the Red Army in the aftermath, translating roughly to “You cannot stop an army which has done Stalingrad”. I’ve written about Kobane in passing before, but considering its raw significance in the fight against ISIS and how it has only become more important in retrospect, I felt it was an event deserving a much more thorough examination. Kobane was remarkable on multiple fronts - the ferocity of its defenders and the decisive Kurdish victory despite lesser numbers and armaments chief among them. But beyond this, certain aspects of the battle harken back to the dialectic means with which warfare has traditionally been processed, namely Kobane’s towering stature as a moral and spiritual victory. In the modern era of technological warfare and cold diplomacy, it’s easy to forget how resounding triumphs like these can be in shaping the outcome of human conflict. Individuals among your number can fall, but the momentum of a great victory survives. What happened at Kobane is the stuff of which folklore is made. As Mark Ames and John Dolan pointed out in their latest podcast, warfare can often be understood as demographics put into violent motion. Traditionally, conflict involved armies defined by ethnic or sectarian demarcations fighting each other largely because they were separate tribes jockeying for the same quarry - frequently land, resources, or other forms of eminence. It’s also why ethnic cleansing as an act of war was endemic, if only because you didn’t want the sons and brothers of the tribe you defeated launching reprisals. But, as history demonstrates, human resilience often proves stronger than attempts at complete erasure, so the outcome of war generally involved the defeated party being forced to accept the limitations imposed by the victor. You respect our newfound territory, we’ll take your resources, and you remember good and well what happened last time. This is partially why the advent of nuclear weapons put an abrupt halt to violent military escalation and the open declaration of war between major powers. We now, in a very honest sense, actually do have the means to eradicate the other party, and they to us. The exercise of antagonism between powerful states made an abrupt turn toward passive-aggressive diplomacy, economic hostility, and large-scale intelligence operations and proxy wars. The sort of machinations that defined the Cold War in all its exhausting entirety. The specter of the nuclear option is also why most open warfare in the modern era is comparatively low-tech. The Syrian Civil War has been fought primarily with handguns and small-impact explosives, and has been fiercely primal in its commitment to the more basic tools of warfare. And, like pre-modern warfare, it has been defined markedly by ethno-sectarian boundaries. So, ultimately, the military victory against ISIS was going to happen under the same small-scale, low-tech terms under which all modern guerrilla armies operate. It also, interestingly enough, occurred in a situation no one saw coming. The defining battle that nudged ISIS into its slow-motion tailspin didn’t emerge from the self-important, pre-planned diplomatic coalitions through which powerful countries attempt to exert themselves. It came from the courage and determination of a comparatively small local defense militia in a city previously unknown to the greater world. Even by the measure of Syrian cities, Kobane was little more than a mid-sized border town. The city proper had a pre-war population of around 40,000. As a point of comparison, Mosul had a pre-war population of nearly 1,850,000 and stood as one of Iraq’s largest urban centers. It was also occupied by a garrison of 30,000 Shia Iraqi National Army troops before its capture. ISIS came at Mosul with a force of about 1,300 fighters in June 2014, with the city falling completely to the jihadis after just six days. The total Kurdish forces defending Kobane at any given point may not have exceeded 2,000, while ISIS came at the city with a strength of 9,000. Yet Kobane held out for four months, with the jihadis suffering a brutal defeat as they persistently tried and failed to overtake its Kurdish defenders. All of this begs the question of why Kobane didn’t fall, and beyond that why the Kurds bloodied ISIS so viciously during the ensuing fight. The obvious conclusion is the above numbers are concealing something beyond their raw arithmetic. The most broad preliminary factor is that the Shia in Mosul were an occupying force in a heavily Sunni city, and the Iraqi National Army troops were poorly trained and terrified at the prospect of combat. They had no stake in that fight, and many dropped their weapons and fled before they could even see the black of ISIS’ flags. ISIS also may not have been entirely unwelcome at first, with the local Sunni beyond angry at the presence of a garrisoned Shia army. The second, and potentially most crucial factor, is the importance of local resistance during insurgent warfare. If the native population presents an organized, steely opposition, they can make urban combat bloody and costly for anyone trying to close in upon home turf. It’s not uncommon for popular memory to fixate on glorified versions of open-field combat where two armies advance toward each other like mobile chessmen - think the Battle of Gettysburg during the U.S. Civil War. In contemporary conflict, most fighting happens street-to-street in densely packed cityscapes. While this might be too reductive, ISIS’ campaign in Syria can arguably be divided between pre and post-Kobane phases, with the failed siege marking the point at which ISIS’ apex was broken and the fragile equation that provided the jihadis with their illusory momentum began to unravel. Which brings us to timeline that preceded the siege on Kobane. If you examine the individual victories ISIS was able to chalk up before they left the densely Sunni tribal areas in northwestern Iraq and central Syria, you’ll note the almost stunning ease with which they fell into the jihadis’ hands. The fall of Mosul was the most notable of these early Iraqi upsets, and was illustrative in terms of both the methodology of its capture and the various spoils ISIS secured in the aftermath. Not only were the jihadis able to acquire massive quantities of American-gifted weapons and vehicles the Iraqi National Army abandoned as they fled, but they even broke into the central bank of Mosul and acquired an alleged $429 million dollars in liquid cash. Like most of ISIS’ early victories, this success came not from their skills as an army, but from their ability to leverage preexisting opportunities that fell in their lap. The American exit from Iraq meant the occupying Shia forces could no longer keep their fist down on the most violent Sunni sectarian malcontents, an inevitable repulsion that ISIS accelerated by barreling into Iraq’s western hinterlands. ISIS also scored an early symbolic victory in 2013 by breaking around 500 inmates out of the Abu Ghraib prison, many of whom were captured Sunni militants. This occurred during a period of lapsed oversight and broad disorganization, with the Iraqi government closing the complex altogether in April 2014 amid fears that nearby jihadis would capture the penitentiary. ISIS’ seeming fortitude was not internally defined, but came instead from broadly exploiting circumstantial weaknesses. This opportunism even played out through their geographic maneuvering - ISIS’ reach was (and is) largely anchored to the Euphrates. 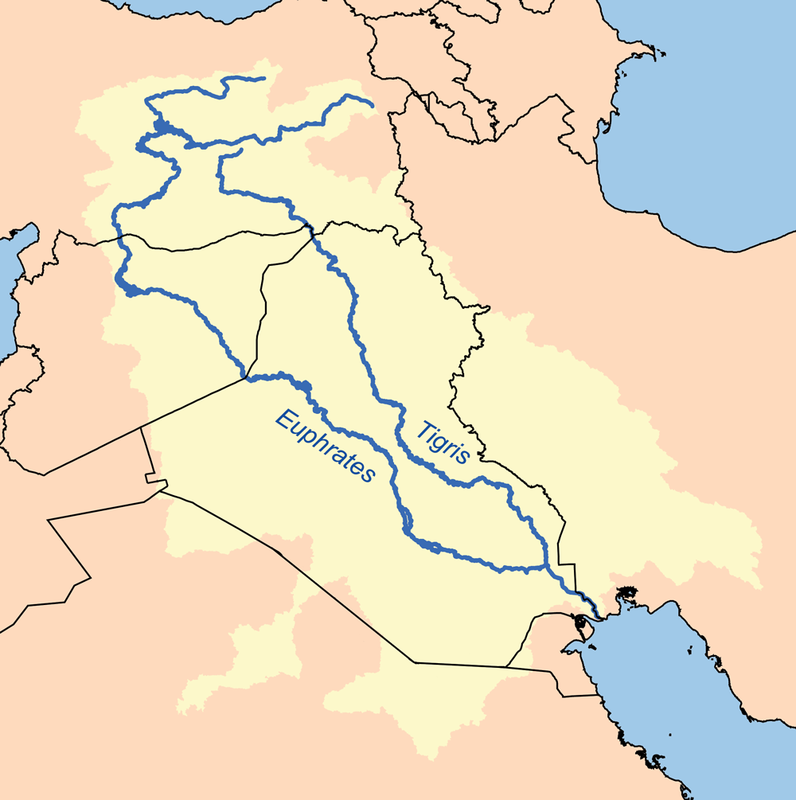 The longstanding Sunni tribal territory in Syria and Iraq was historically defined by its close adherence to that life-giving river, and the Euphrates represented a sort of conqueror’s road along which ISIS could pin its forward velocity. The major consequence of this is it gave ISIS a predetermined path along which to define their campaign, sparing them the difficult questions around territorial logistics during the frantic momentum of their 2013-2014 expansion. All they had to do was unleash that reckless aggression northward and let the primordial logic of river geography do the heavy lifting. As a consequence, ISIS was profoundly unprepared in terms of planning and strategy once they were forced to move beyond the Euphrates itself. Their advances along the river occurred with full force directed at a single angle, which allowed them to sweep over the halfhearted resistance they encountered. Once the defining template of the river was out of the picture, ISIS was forced to awkwardly negotiate territorial advance along new fronts. So they spread out, rather tentatively considering their earlier Euphrates-bound rampage, into the outskirts of Kurdish territory northeast of the river. Something that commenters seem to miss when obeying the limited incident-by-incident means of understanding the Sunni insurgency is just how slapdash and improvised damn near everything about ISIS’ existence has been. Almost all aspects, from their acquisitions and funding, to manpower and troop accumulation, to municipal management, to campaign strategy and martial planning, have been awkwardly cobbled together as the war has unfolded. What happened in 2014 was a near-freak coincidence of every factor lining up in ISIS' favor, handing them the limited burden of storming across open terrain and spewing as much of their noisy propaganda as possible in the wake of easy victories. And despite the severe changes within the military-logistical equation that emerged when ISIS ventured into Kurdish territory, they kept barreling forward, convinced their earlier momentum was enough to guarantee success and further territory. When the jihadis finally closed in on Kobane proper, they split their advance across the eastern, southern, and western fronts, diluting their force impact and making it easier for local Kurdish holdouts to resist. It was a rather different exercise than a singular column moving down the river, and a pretty terrible choice considering ISIS’ newfound opponents. The Kurds have spent their entire existence fending off hostile incursions, using knowledge of their native mountain terrain as a tactical fulcrum against potential invaders. They also have a reputation as a simultaneously tough and composed people, which is an absolute necessity when you’re surrounded by Turks, Arabs, and Persians. Those groups don't always make the most cordial neighbors, to put it mildly. From any point in history, if you see the conduct of Kurdish fighters you notice a simultaneous bravery and stoic resignation to the possibility of death. The word “Peshmerga”, the name for Iraqi Kurdistan’s national army, even translates directly to “one who faces death”. That’s what the Kurds have done for generations - sustained an unwavering staring contest with Death, never blinking and never looking away. Because of this, Death has a funny tendency to lose, and the Kurds have persevered. The Kurds have always outlived their tormentors with determination and courage. They most recently endured the genocidal horrors inflicted on them during Saddam Hussein’s murderous Anfal campaign. Surviving, mourning their dead with the quiet dignity that is the Kurdish way, the Iraqi Kurds stood firm for 20 years after the Anfal until Saddam himself died a humiliating death at the hands of a Shia lynching squad. It was, like much of Kurdish history, a lesson in cool determination and contained resilience. When reporters speak with Kurdish soldiers about the harshness of the anti-ISIS campaign, you hear a common refrain - “I'm not afraid of death” uttered calmly and directly. This isn’t because the Kurds are a morbid people. It’s largely because they realize the safety and future of Kurdistan is greater than any one person. These admissions are not the dishonest bragging of the yammering troglodytes in ISIS, just the matter-of-fact statements of Kurds who know good and well there are worse things than fear itself. It’s the voice of a tribe who have faced both Turkey and Saddam Hussein and turned their proud survival into a prolonged laugh against those who’d wish to see them exterminated. The Syrian Kurds see the fight to defend their homeland as part of the long struggle to shape and protect the future of Kurdistan as a whole. It's understood as a noble chapter within a greater historical narrative. While it might be too reductive to chalk up the Kurds’ overwhelming success against ISIS solely to their martial culture and steely courage, it demonstrates the towering significance of doctrine and morale in determining the outcome of armed conflict. Armies who will earnestly fight to their last are lethal adversaries. War, after all, is fought by people, and people who work closely in highly frenetic situations. It’s easy to forget this in the era of deceptively “clean” drone warfare, but people who fight on calmly even in the face of severe brutality have a funny tendency to win. As the Syrian war has dragged on, there have been wry anecdotes of Kurdish soldiers getting vexed at the near-compulsive shouting and exclamations of “Allahu Akbar!” coming from friendly Arabs fighting alongside them. If you see recordings of Kurdish soldiers in the midst of combat, one of the things you’re struck by is how resolutely quiet they are. The YPG/YPJ often fight in silence. If you watch recordings of predominantly Sunni Arab jihadi groups (ISIS being the biggest among them), you’re overwhelmed by the jackal-like yapping they produce even during relatively benign combat situations. And let’s not kid ourselves, there are far more videos of Sunni jihadis in combat (or in “combat”) floating around the digital airwaves than there are of Kurdish soldiers. ISIS has a rather vested interest in turning the cold, methodical practice of warfare into prepackaged theater. The Kurds are far more practical, and far more professional. When ISIS came scampering into Kurdish territory, the local defenders looked at yet another group of noisy Arabs yelling about murder and stared them down coldly as is a matter of habit. The stretch of terrain between the Euphrates and Kobane is dotted by a string small hamlets, many of which didn’t have much in the way of organized local resistance. The geographic distance from ISIS’ closest city along the Euphrates (Jarabalus) to Kobane itself was roughly 15.5 miles or 25 km. Yet due to a combination of either operational indecision or the small Kurdish holdouts fighting back too fiercely, it took ISIS 14 months to reach the outskirts of Kobane - they captured Jarabalus in June 2013, and didn’t begin menacing the greater Kobane canton until July 2014. In fact, initial attempts on Kobane in the summer 2014 were repelled, with ISIS allegedly losing close to 700 fighters in a failed first push to reach the city. As a point of comparison, ISIS captured a swath of Iraqi territory spanning roughly 31 miles/50 km from Fallujah to Ramadi in the span of January 2014 alone. This is where that classic Kurdish stoicism and refusal to bow to armed incursion came into play once more. Kobane was never a large or even strategically pivotal holdout. ISIS wasn't slated to gain an arms depot or desperately needed transport route. In terms of ISIS’ broad strategic preoccupations, Kobane was a rather peripheral concern. Except, in this instance, the locals outright refused to be overrun and turned the fight for one mid-sized border town into a costly, bloody venture for ISIS. What, in many other cases, would have been a relatively easy capture in an army’s forward campaign became an excruciating fight that stopped the jihadis dead in their tracks. No matter how many resources ISIS threw at the city in mounting desperation, the Kurdish defenders stood and outfought them. In effect, the Kurds forced ISIS to exert their full strength all for the sake of losing the fight for a small town. The battle for Kobane proved that ISIS was so weak against skilled opponents that even their army deployed at full capacity couldn’t overrun a hardened defense. It was the exact moment at which ISIS was no longer able to rely on the localized conditions that propelled the Iraq campaign and their scurry up the Euphrates, and were given a live demonstration of their inadequate martial skill as they hemorrhaged fighters and resources against the Kurdish resistance. ISIS managed to elbow through and reach the outskirts of Kobane on September 13 2014, storming a series of nearly 350 small villages within a three-week span. Where the previous attempts at taking the greater canton were relatively tentative, ISIS effectively marshaled the full strength of their forces before this last push - deploying a sizable quantity of both tanks and heavy artillery in their advance toward the city. ISIS had crawled to 15 km of the city within a week, relying on a crude strategy of heavy bombardment against the lightly armed Kurdish defenders scattered throughout the city's satellite villages. And with this advance came the usual litany of ISIS brutality - the jihadis reportedly inflicted a campaign of horrific cruelty against Kurdish civilians, and even took to broadcasting the beheading of Kurdish women fighters in their wake. By the start of October 2014, ISIS had surrounded Kobane from the east, south, and west, and started infiltrating the city itself. All of this occurred, of course, in the midst of Turkey's callous refusal to lend aid to Kobane's defenders - who Erdogan's flunkies referred to bizarrely as "terrorists". In a refreshing change of pace, it seemed that Turkey's genocidal impulses toward the local Kurds were being acted out by another party on their behalf. But as has always been the case, the Turks watched their homicidal ambitions toward the Kurds turn out a to be bit less effective than planned. What happened in Kobane throughout the ensuing month may well go down as the bravest stand of the entire Syrian Civil War. ISIS's desperate scare tactics proved useless, and the Kurds fought on even as the jihadis barreled into Kobane proper and began ransacking the city - raising that obnoxious flag over key sites and setting much of the city aflame to create a sort of tactical smokescreen against American airstrikes. The Kurdish YPG/YPJ guerrillas didn't flinch, and waited in cold anticipation for the drooling sadists careening around their hometown to start slipping up as they advanced toward the city center. Kurdish infantry as a whole are renowned for their ability to hold the line against superior numbers, and this proved deadly to ISIS considering their primary means of military advance involves recklessly barreling into their opponents' position in the hopes of using fear and sheer troop volume to overwhelm them. When ISIS realized this tactic wasn't going to work, their complete lack of basic discipline and martial acumen turned fatal. The jihadis began suffering massive casualties by the middle of October, consistently walking into ambushes and outmaneuvered by the shrewd, lightly armed Kurdish guerrillas. ISIS doubled down on their habit of charging blindly forward even when the U.S. began ramping up its bombing raids, with the jihadis effectively running headfirst into a combination of Kurdish snipers and vicious airstrikes. By any measure of sane military planning, ISIS' maneuvering throughout October 2014 was a stunning display of self-destructive idiocy. By February 2015, ISIS may have lost well over 3,0000 fighters while the Kurds reported a combined loss of no more than 750. In the long calculus of war, the victor had become painfully obvious. With ISIS' ranks decimated and the Kurds overwhelmed by a sense of imminent victory, Kobane's defenders began pushing outward. Within two months of October's end, the city had been recaptured with the Kurdish forces already in the process of surgically removing ISIS fighters from Kobane's surrounding villages. Yet what happened in the aftermath of Kobane might have been even more humiliating for ISIS than the fight itself. The Kurds spent the remainder of 2015 advancing rapidly eastward - expelling ISIS from occupied territory near the Euphrates and expanding Kurdish military reach in northern Syria. The Kurds have persistently defeated the jihadis at pivotal connecting points, severing their supply lines and forcing ISIS to retract further and further into the Sunni Arab tribal land they hold along that fateful river. This pattern of unbroken success has continued up through this point, with Kurdish forces in both Syria and Iraq expelling ISIS outright (as they did in Sinjar last month) or forcing them into increasingly vulnerable holdouts. The jihadis have since crawled away from the Kurdish front, far too damaged and humiliated to stage anything effective against the intelligent maneuvering of their unflinching opponents. One of the primary consequences of the failed siege on Kobane is that ISIS was too heavily wounded to launch new offenses in the aftermath. As 2015 has rolled to a close, this seems to have been more of a fateful holding pattern than a transient setback. ISIS has also burned through much of the armaments and cash they originally plundered in Iraq. Their revenue generation is tied overwhelmingly to the black market oil trade, and they’re now forced to consider the difficult realities of territory management - something at which ISIS is utterly failing. The various factors that allowed them to sustain their earlier campaigns have been either clipped or removed altogether. In the incident-by-incident, snapshot view of warfare it’s often hard to realize that broader phenomenon can determine the outcome of armed conflict. Being divorced from this context is why much of the public seemed to take ISIS’ stated claims to conquer as far as Europe with some degree of honest seriousness - if they can capture that much Sunni tribal land so quickly, who’s to say they can’t do the same everywhere else? ISIS has nowhere left to go in the Levant at this point, and are nervously stewing within their threatened territory while getting eyed by increasingly well-prepared opponents. The limitations of their reach and fragility of their operational tendencies become more obvious by the week. When studying something as inherently tumultuous and savage as armed conflict, there’s a pressure to scrutinize the proceedings with a sort of cool detachment. War in summation is a brutal and brutalizing thing; valor is rare, while dumb aggression reigns everpresent. Most analysis demands this be taken as a given and all writing rendered in the most clinical terms possible, but I’m not even going to attempt to feign objectivity in this case. What happened at Kobane was an act of heroism so resolute that it’s difficult not to feel humbled by it. And despite the hateful cowardice of ISIS’ sporadic post-facto suicide attacks, Kobane is being rebuilt with quiet determination. There was even an instance of a wedding being held in the city only eight months after the siege was broken. The Kurds, as always, have persevered. When Syria’s myriad violences burn themselves out and the conflict is handed to the retrospect of history, it's the stand at Kobane that deserves to be remembered above all else. Header photo taken from <a href=""https://www.flickr.com/photos/kurdishstruggle/16516636161/in/photolist-pWiwxH-pzYtvN-ps8h7P-zymtNS-B1xJrT-AmAXqC-pHotuZ-oZX7ih-zkKpfS-pPP9aa-xvEUca-qU9VHB-prcjhE-yAr1HZ-pw7gto-qPijkA-pMgLDw-AjANNV-zrdFez-z6js2c-pNg6GJ-pgrWtE-qggMmr-yEfy5m-xLrNeS-B8FWSY-prvac4-BwFBSo-raw5uZ-ACv9PV-ysAFX4-Bdpypg-pPPv7v-pzVjUp-x9AEjQ-BYP68R-pNPMps-AWM667-zpv9KL-yAr4Ax-uH3x83-B3bzh1-pN13EC-pXAygT-pFo7nW-wH4fL9-p7faCH-qSjwmD-pHwFRZ-oZZnVt">Flickr Creative Commons.